Riding the momentum following the presidential election, stocks surged for much of the first quarter of 2017. Buoyed by the anticipation of tax cuts and policies favorable to domestic businesses, the benchmark indexes listed here reached historic highs throughout the quarter. At the end of January, the Dow reached the magic 20000 mark for the first time, while the tech-heavy Nasdaq gained almost 4.50% for the month. The trend continued in February, as stocks posted solid monthly gains. The Dow closed the month with a run of 12 consecutive daily closings that reached all-time highs. The S&P 500 also achieved a milestone — 50 consecutive trading sessions without a daily swing of more than 1.0%. 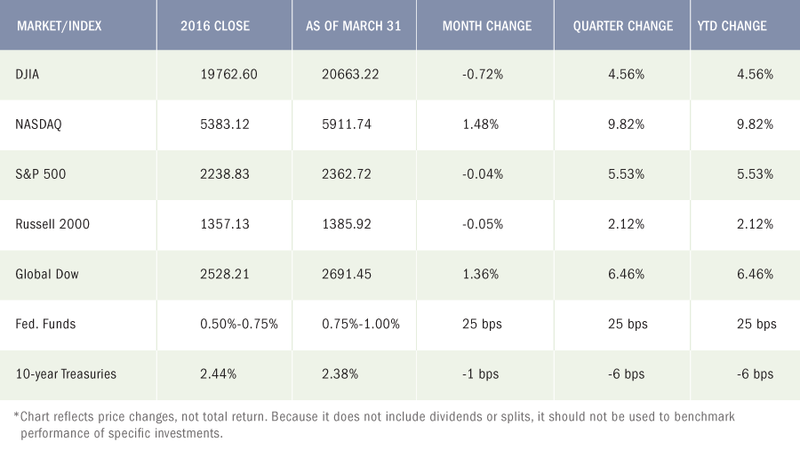 At the close of trading in February, each of the benchmark indexes listed here posted year-to-date gains, led by the Nasdaq, which was up over 8.0%. Riding the momentum following the presidential election, stocks surged for much of the first quarter of 2017. With a rebound in inflation expectations and a synchronized pick-up in economic indicators, investors may want to embrace the moment but at the same time, rethink their investment stance and review their allocation. While we believe the equity markets have priced in a lot of good news, there appears to be plenty of buyers who haven’t participated. What this means is that any substantial market selloff has been met with buyers looking to take advantage of lower equity prices. Barring any unforeseen major event, this trend may continue. However, while we don’t believe it is time to just blankly sell equities, we also don’t want to be complacent and we are therefore taking a cautious approach, with an eye towards hedging and protecting our client assets. With global growth expectations on the rise, we see room for more upside surprises in the ongoing global recovery that is continuing to improve corporate earnings abroad. The strong prospects for earnings growth, combined with reasonable valuations overseas, makes international equities appealing to us. Think “Global”! The FOMC next meets during the first week of May, when it will consider another interest rate hike. If employment remains strong and consumer prices trend higher, the Fed may raise the target range rate to 1.25% following their next meeting, with at least one more rate increase likely before the end of the year. While we see a low probability of a sharp and sustained surge in yields, our outlook for bonds is less optimistic. Fixed income assets are likely to be challenged amid broadly rising interest rates. We believe its is very important to maintain diversification and a dynamic approach to fixed income investments. February’s employment report showed continued strengthening in the labor sector with 235,000 new jobs added in the month, on the heels of 238,000 new jobs added in January. Job gains occurred in construction, private educational services, manufacturing, health care, and mining. The unemployment rate dipped to 4.7% — down from 4.9% a year earlier. There were 7.5 million unemployed persons in February. The labor participation rate inched up 0.1 percentage point to 63.0%. The average workweek was unchanged at 34.4 hours in February. Average hourly earnings increased by $0.06 to $26.09, following a $0.05 increase in January. Over the last 12 months ended in February, average hourly earnings have risen by $0.71, or 2.8%. Following its meeting in March, the Federal Open Market Committee raised the target range for the federal funds rate by 25 basis points to 0.75%-1.00%. This is the first interest rate change for 2017, although the FOMC projects that it will increase rates two more times this year. The Committee expects that economic activity will expand at a moderate pace, labor market conditions will strengthen somewhat further, and inflation will stabilize around 2% over the medium term. FOMC Chair Janet Yellen supported the current rate hike, cautioning that without gradual rate increases inflation could escalate, requiring the Committee to raise rates rapidly which, in turn, could risk disrupting financial markets and push the economy into recession. The price of crude oil (WTI) closed March at $50.85 per barrel, after spending much of the month hovering around $48.00 per barrel. The national average retail regular gasoline price was $2.314 per gallon on February 27, 2017, $0.018 higher than the January 30 price and $0.531 more than a year ago. Expansion of the U.S. economy slowed over the final three months of 2016. According to the Bureau of Economic Analysis, the fourth-quarter 2016 gross domestic product grew at an annualized rate of 2.1% compared to the third-quarter GDP, which grew at an annual rate of 3.5%. Growth in the GDP was slowed by downturns in exports, federal government spending, and business investment. A positive from the report is the rise in consumer spending, which increased 3.5% over the prior quarter. An indicator of inflationary trends, the price index for gross domestic purchases increased by 2.0% in the fourth quarter, compared to an increase of 1.5% in the third quarter. As to the government’s budget, the federal deficit for February was $192 billion. Over the first 5 months of the fiscal year, the deficit sits at $385 billion, which is 0.7% below the same period of time last year. Inflation, as measured by personal consumption expenditures, reached the Fed’s 2.0% annual target in February. For the 12 months ended in February 2017, personal consumption expenditures expanded at a rate of 2.1%. Core PCE (excluding energy and food) increased 1.8%. For February, PCE climbed 0.1%, while core PCE rose 0.2%, following a 0.3% monthly increase in January. Personal income (pre-tax earnings) rose 0.4% for the month, and disposable personal income (income less taxes) enjoyed a 0.3% increase over January. For the 2016 calendar year, personal income increased 3.6% from the 2015 annual level, compared with an increase of 4.4% in 2015. Disposable personal income increased 3.9% in 2016, compared with an increase of 3.8% in 2015. In 2016, PCE increased 3.9% compared with an increase of 3.5% in 2015. The prices companies receive for goods and services trended higher in February as the Producer Price Index climbed 0.3% for the month. Year-over-year, producer prices have increased by 2.2%. Energy prices have played a large part in the upward movement of the PPI, climbing 0.6% in February. The PPI less food and energy has risen 1.5% for the year, after climbing 0.3% in February. Consumer prices also increased marginally in February, climbing 0.1%. However, consumer prices are up 2.7% for the year, a mark that is not only well above the Fed’s 2.0% target for inflation but stands as the highest rate of growth in almost five years. Even the core rate, which excludes energy, is holding steady at 2.2% since February 2016. The housing sector proved to be a mixed bag in February as the sales pace of existing homes slowed while new home sales increased. Higher home prices and a lack of available homes for sale are the main reasons for the drop in the sales of existing homes, which fell 3.7% to a seasonally adjusted annual rate of 5.48 million, down from January’s revised annual rate of 5.69 million, according to the National Association of Realtors®. However, February’s sales pace is still 5.4% above a year ago. The median sales price for existing homes was $228,400 — up 7.7% from January. Total housing inventory at the end of February increased 4.2% to 1.75 million existing homes available for sale, but is 6.4% lower than a year ago (1.87 million) and has declined year-over-year for 21 straight months. Conversely, the Census Bureau’s latest report reveals a spike in new home sales. Sales of new single-family homes increased by 6.1% in February to an annual rate of 592,000 — up from January’s rate of 558,000. The median sales price of new houses sold in February was $296,200, while the average sales price was $390,400. 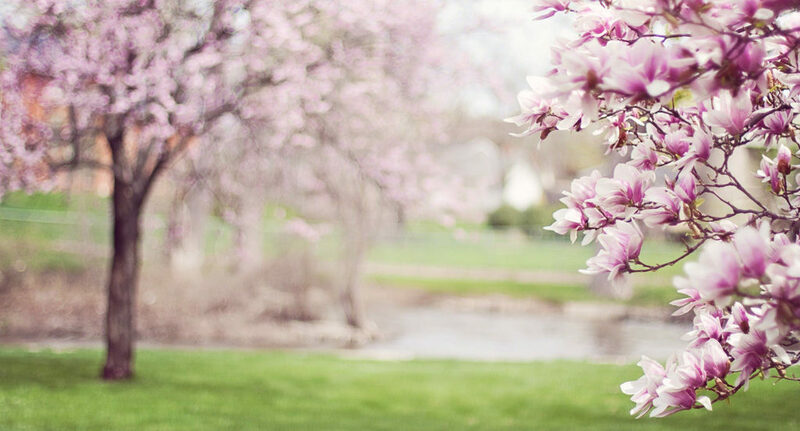 The seasonally adjusted estimate of new houses for sale at the end of February was 266,000. This represents a supply of 5.4 months at the current sales rate, which is up from 262,000 homes available (supply of 5.4 months) in January. One of the reasons the Fed raised interest rates in March is the increase in manufacturing production. The Federal Reserve’s monthly index of industrial production (which includes factories, mines, and utilities) remained at the same level in February as the prior month, held down by another weak month for utilities. Unseasonably warm weather prompted utility production to fall 5.7% in February following a 5.8% drop in January. However, manufacturing production increased by 0.5% month-over-month, which is the largest increase in monthly volumes since July 2015. At 104.7% of its 2012 average, total industrial production in February was 0.3% above its level of a year earlier. Capacity utilization for the industrial sector declined 0.1 percentage point in February to 75.4%. As for durable goods, the latest report from the Census Bureau shows new orders increased 1.7% in February from the prior month. Excluding the volatile transportation segment, new durable goods orders gained a lackluster 0.4%. Orders for core capital goods (excluding defense and transportation) dropped 0.1% for the month, but are up 2.7% over February 2016. The advance report on international trade in goods revealed that the trade gap narrowed by 5.9% in February. The overall trade deficit was $64.8 billion in February, down $4.1 billion from January. Exports declined 0.1% to $126.8 billion, $0.1 billion less than January exports. Imports fell 2.1% to $191.6 billion, $4.2 billion less than January imports. The prices for U.S. imports of goods advanced 0.2% in February, led by higher nonfuel import prices, which more than offset lower fuel prices. U.S. export prices rose 0.3% in February, after advancing 0.2% in January. Export prices haven’t recorded a monthly decline since the index fell 0.8% in August 2016. A relatively positive stream of eurozone economic data helped international stocks post gains for February. Both manufacturing and service sectors accelerated during the month, while eurozone job creation reached a 10-year high. In Great Britain, Prime Minister May continued to push forward with Brexit amid pushback from Parliament and protestors. Nevertheless, the UK delivered written notice to the president of the European Union, formally beginning the process of leaving the EU. This action now opens a two-year window for Britain to negotiate the terms of its exit. One of the potentially contentious issues that will be addressed is whether, and how much, Britain will pay to leave the bloc. In Japan, retail sales increased 1.0% for the month, although the fourth-quarter GDP growth slowed from the previous quarter. The Conference Board Consumer Confidence Index® for February rose 3.2 points to 114.8. Consumers expressed confidence in the job market, which increased expectations for the economy in general. The Surveys of Consumers of the University of Michigan Index of Consumer Sentiment dipped from a 10-year high of 98.5 in January to 96.3 in February. Nevertheless, consumers continued to express optimism about current economic conditions, as the Current Conditions Index has been trending upward since December 2016.